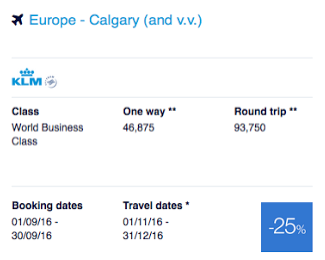 Air France KLM Flying Blue's Promo Awards is something I cover on Rewards Canada each and every month but haven't posted it here as Calgary has not been included in these discounted award ticket offers for ages! Finally YYC is now included in the September offering hence the post here! Sometimes this offer is good for up to 50% off the number of miles required for travel on Air France or KLM but this month all Canadian cities are at 25% off business class. So while 25% isn't as good as 50% of course, it still is something to look at if you were planning travel for the last two months of the year and Flying Blue redemptions were be considered for that travel.